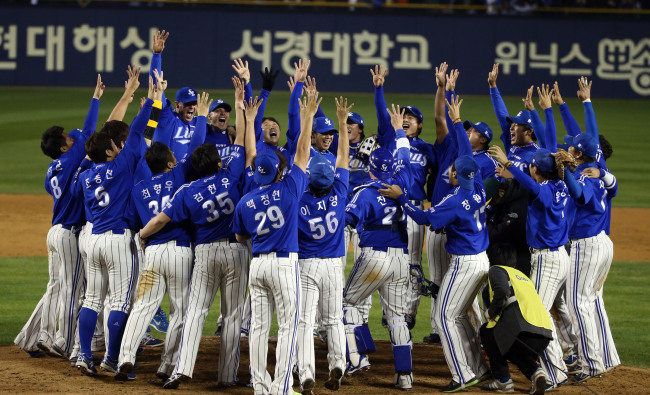 The Samsung Lions are the champions of South Korean baseball for the fourth straight year. The Lions pounded the Nexen Heroes 11-1 on Tuesday to capture the Korean Series in six games at Jamsil Stadium in Seoul. The Lions became only the second team to win four consecutive Korea Baseball Organization (KBO) titles in the league's 32-year history. Yamaico Navarro, voted the Korean Series MVP, belted a three-run home run in the top of the sixth inning, his record-tying fourth home run of the Korean Series, and drove in five runs himself, as the Lions provided more than enough offense for starter Yun Sung-hwan. The right-hander limited the Heroes to one run on three hits over six impressive innings. The Heroes came up short of winning their first-ever Korean Series. They blew a 1-0 lead with two outs in the bottom of the ninth in Monday's Game 5, and failed to regroup in time to stave off elimination on Tuesday. The Lions were befuddled by Nexen starter Oh Jae-young through the first two innings, with no hits and four strikeouts against the left-hander. The Lions then exploded for four runs in the top of the third to break open the game. After a single, an error and a walk loaded the bases with one out, Chae Tae-in lined a two-run single to right, chasing Oh from the game. Facing the new pitcher, Moon Sung-hyun, with men at the corners, Choi Hyoung-woo sent a double to right-center field gap to bring both runners home, staking the Lions to a 4-0 lead. After being held hitless by Samsung starter Yun Sung-hwan through the first three innings, the Heroes finally solved the right-hander in the bottom of the fourth. Seo Geon-chang led off with a single and came around to score on a double by the next batter, Lee Taek-keun. With their No. 3, 4 and 5 hitters due up, the Heroes failed to cut further into the deficit. Yoo Han-joon grounded out to first, while Park Byung-ho struck out swinging and Kang Jung-ho flied out to right. The Lions failed to pad their lead after loading the bases with two outs in the fifth, as Kim Hun-gon grounded into a force play at second. The Lions soon would have another chance and didn't miss it the second time. Cho Sang-woo, Nexen's third pitcher, hit Lee Ji-young to start the sixth. Kim Sang-su laid down a bunt to move Lee over to second, but first baseman Park Byung-ho slipped and fell trying to field the ball, leaving both runners safe. Navarro then stepped up and drilled a 1-2 fastball over the left-center field wall, putting the Lions up 7-1. Navarro, who hit 31 home runs in the regular season from the leadoff spot, tied Tyrone Woods of the 2001 Doosan Bears for the most home runs in a single Korean Series. The 2001 Korean Series also went six games. The Lions kept kicking the Heroes while they were down. Woo Dong-gyun hit a pinch-hit, two-run single in the top of the seventh for a 9-1 lead, and Navarro drove in his fourth run of the game with a single to center, putting the Lions up 10-1. Navarro picked his fifth RBI of the night with a single in the top of the ninth. The Dominican Republic native earned 32 out of 73 media votes to win the Korean Series MVP honors, after going 8-for-24 with four home runs and 10 RBIs in six games. He's the third foreign player to be voted the MVP in the KBO championship series. The Heroes self-destructed with three errors and seven walks. They also hit into two double plays. Yun Sung-hwan, who held the Heroes to one run in seven innings in Game 2, was just as effective to earn his second victory of the series. He now has four Korean Series wins in his career. Oh Jae-young retired six of the first seven batters he faced before collapsing in the third. The losing pitcher lasted just 2 1/3 innings and was charged with three earned runs on two hits and two walks. The Heroes' bullpen failed to keep the team in the game after Oh left. Five relievers were tagged for six runs, one of them unearned, over the final 6 2/3 innings.